Sen. Barbara Boxer and guest speaker Rebekah Phillips, a student from SF State, speak at a press conference at the Federal Building in Downtown San Francisco to discuss a rate hike on student loans. Photo by Andy Sweet, Special to Xpress. Between rising tuition, severe budget cuts and a possible interest rate increase on college loans, students are growing frustrated with the cost of higher education. Not long ago, national student debt passed the $1 trillion mark, surpassing the total amount Americans currently owe on their credit cards. If Congress does not make a decision on Senate Bill S. 2343, student loan interest rates will double on Federal Stafford Loans, from 3.4 percent to 6.8 percent. The hike will affect new loans for the 2012-2013 academic year. 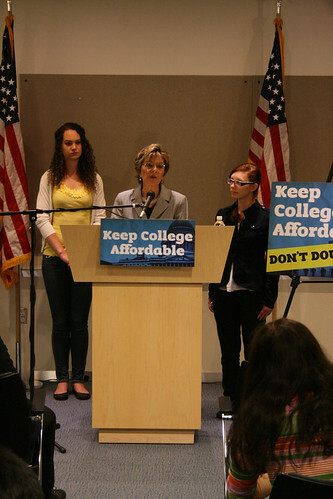 “Students should be watching the Senate,” Sen. Barbara Boxer said during a May 11 press conference at the San Francisco Federal Building to discuss the possible increase, which will affect nearly 7.5 million students across the country. Presently, Stafford Loans are at a fixed rate of 3.4 percent and available to students who attend school at least part time. They are the most common loans for university students and have a borrowing limit of $20,500, according to the official Stafford Loan website. Senate Republicans blocked the bill May 8 after objecting to the way it would be funded. The bill is slated to be funded through a proposed tax increase on Social Security and Medicare for high-earning stock shareholders of private corporations. This would prevent federally subsidized Stafford Loan interest rates from increasing July 1. “Not a single Republican voted to take up this bill,” Boxer said. President Barack Obama has also addressed the issue of the possible interest rate increase, visiting several campuses throughout the country and speaking to students who could be affected. Rebekah Phillips, a 20-year-old journalism major, was a guest speaker at the press conference. She is the first in her family to attend college and is worried about the possible interest rate hike. “Right now I owe $14,135.81 in student loans. If the interest rates double it will take me two to three times longer to pay off my student loans.” Phillips said. Phillips said she is too young to be considered independent on her FAFSA, and her parents’ income makes her ineligible for most grants. “I moved out of my parents’ house when I was 16, but because I’m so young I’m forced to use my parents’ income (when filing for financial aid),” Phillips said. According to Barbara Hubler, SF State student financial aid director, there hasn’t been much feedback from students regarding the potential interest rate increase. “We sent an email to more than 30,000 students about the federal changes to student loans,” said Hubler. Classics major Sharvonne Spears said she has been in college for three years and expects to graduate Spring 2013. Although she will graduate in four years, she is frustrated because going to school is so expensive. “As of now I owe $40,000. I’ve used loans every year. Some are grants, the bulk are subsidized and unsubsidized,” Spears, 26, said. According to Boxer, the most important thing students can do is to take action. “Go up on Facebook, Twitter, Email, get signatures and send it to the Republican leadership. You have power and a voice to be heard,” Boxer said. 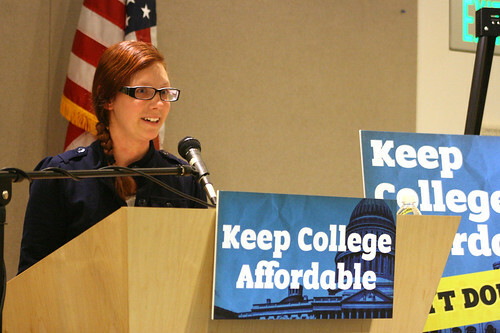 Rebekah Phillips, a student from SF State, speaks at a press conference held by Barbara Boxer at the Federal Building in Downtown San Francisco to discuss a rate hike on student loans. Photo by Andy Sweet, Special to Xpress.